Not a best! Need help! This plant is putting out roots on the stems, and I'm wondering if I should cut them off and put them in new pots. I'm a novice and the orchid is self sustaining and does it's own thing, ie grows and lives in spite of me! But it is trying so hard, I need to help it. It hasn't bloomed since I got it while blooming--2-3 years ago. Very helpful advice! Sink sprayer is a great idea. Thank you very much for your suggestions. I have just moved this orchid to a location where it gets a lot more light. (I'm letting it adjust gradually.) I am going to leave it attached also, and adjust the watering. Normally I think I water them too much, because they are air plants, right? Get most of their nutrients from the air? 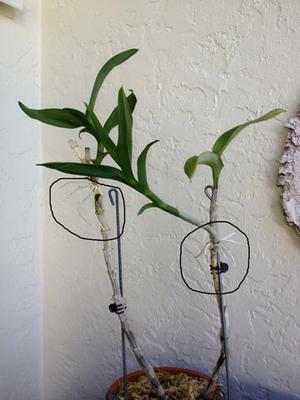 Your Dendrobium might need more light; how bright is the spot where you grow it? If it won't bloom for you, I would try gradually acclimating it to as much light as it can stand without getting sunburn. If that doesn't seem to solve the problem, you could try increasing the watering a little; sometimes plants that are slightly underwatered will sulk like this. Join in and write your own page! It's easy to do. How? Simply click here to return to Dendrobium Orchid.